Hello Falcon Friends! 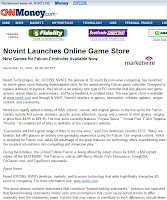 Today Novint officially announced that our Game Store is open! Don't forget, you heard it here first! You can check out our announcement on our Web site. There's a lot going on at Novint! We're going to be making another big announcement tomorrow morning as well. Keep checking back here for the inside scoop on our news! Happy Falcon gaming! It looks like you guys are making progress on getting more games lined up for the Falcon, which is great. My concern is that just about no one knows about the Falcon. Web traffic to your site is abysmal and you didn't get the online store launched until last week. That is way too close to Christmas to capture any significant gift sales. I realize that you ugys worked hard to get them in stores ahead of the holidays, and I applaud those efforts, but the fact is the majority of people don't even know they exist never mind that they are availalable in stores nationwide. What are you going to do to change that? The viral marketing path you have chosen is not working. You really need to go mainstream in my opinion. We appreciate your comments and perspective. As a small start-up company, Novint has worked hard to create awareness for our technology and products. Understanding that our core target audience values peer and media reviews much more than traditional advertising, we've focused the majority of our efforts on public relations and giving people first-hand experiences with the Falcon. As you can see from the News section of our website, we've generated incredible press from major consumer and industry magazines, websites and television, including Men's Journal, BusinessWeek, CNN, Blender, Penthouse, Engaget, MSNBC, C/NET, CBS, and many more, generating millions of impressions. We also introduced the Falcon to thousands of people on our recent Swoop Tour. Additionally, our game store opened last week and we continue to add new titles, with over 45+ games that are available or in development and scheduled for release in the next couple of months. Our website, from our perspective, enjoys healthy traffic with thousands of new visitors each month (over 70%). We will, of course, continue to work to create product awareness through a variety of programs. Ultimately, since Novint plans to license our technology to others, we also expect that larger companies, with significantly larger marketing budgets, will help us do some of the heavy lifting to promote the Falcon as we move forward.